I love all things floral. Actual flowers (especially those just waiting patiently in their sleeves for me to scoop them up! ), flowers represented in art (from Botticelli to Warhol), flowers and plants that come together to create gorgeous gardens, and flowers as inspiration for everything else in life, from decorating to cooking to traveling to shopping! Along with my passion for flowers comes a love for historic houses and estates, antiques (usually English), silver, china, colorful fabric, wall coverings, trim and accessories. But I don’t stop there. These days, as an empty nester who flatly refuses to go back to practicing structured finance law (do you blame me?? ), I seek out new destinations, new books, new ideas and new products that, in one way or another, involve floral elements (even in the tiniest way!). And if I'm not exploring the world around me for new things, I’m creating arrangements or working on my new line of floral themed accessories. 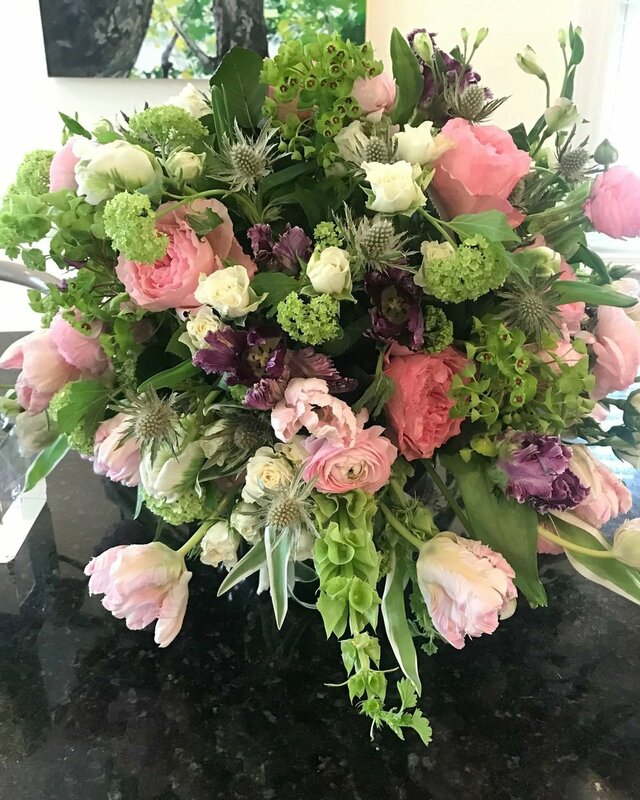 When it comes to my arrangements, I'm always on the lookout for the unexpected--elements that I can incorporate into my designs to enhance their beauty and create interest. Having studied with the amazing Paula Pryke in London, I tend to create designs that speak to the British tradition, but I never forsake my first and favorite floral influences--my mother and my grandmother and our beloved Williamsburg and Charlottesville, Virginia--with a little bit of NYC thrown in for good measure. I’ve also trained as a professional florist in Boston. So I’ve made the rounds and have many and varied influences. All wonderful and all important. and for various other Boston area nonprofits. I'm available by appointment for consulting, designing and arranging, workshops and, finally, for the holiday planning and execution of your floral and greenery dreams, both inside and outside the home. I am a current member of the Weston Garden Club and served on the Committee for the Massachusetts Horticultural Society's 2017 Garden Party. I am also a former member of the Nantucket Garden Club, where I served as a judge for the Nantucket Flower Show in 2014. I continue to volunteer for the Club each and every chance I get! And that is *plenty* about me!! I hope that you will enjoy the site and visit often. OH~~~And please follow me on Instagram, Pinterest, FB and anywhere else I may happen to end up!